Bonsai describes the ancient Japanese art of growing miniature trees by rigorous pruning of their roots and branches. Because of their small size, aesthetic appeal, and minimal upkeep requirements, Bonsai trees have long been popular additions to offices and homes. In late 2000 the website bonsaikitten.com debuted. It described how to apply the same Bonsai principles to kittens. The idea was to seal kittens inside glass containers. As they grew (fed and watered through a tube), the bones of the cats would supposedly conform to the shape of whatever container held them. At the end of the process a uniquely shaped 'Bonsai Kitten' would emerge. "You no longer need be satisfied with a house pet having the same mundane shape as all other members of its species," the site declared. "With Bonsai Kitten a world of variation awaits you, limited only by your own imagination." The site also advertised that hand-grown Bonsai Kittens were available for sale to the public. The site contained numerous, over-the-top details designed to provoke outrage. For instance, it described the soft, springiness of kitten bones, claiming that "if you take a week-old kitten and throw it to the floor, it will actually bounce!" It also provided details involving super glue and plastic tubes for dealing with waste removal: "as the kitten's body is still developing, a natural rectal diverticulum will soon form around the tube." Finally, it offered the disturbing reminder that one should remember to drill an airhole for the kitty. Pictures from the Bonsai Kitten website illustrating how to create a Bonsai Kitten. The caption stated, "Initial insertion, with aid of Alessi shoehorn. Kitten has been given muscle relaxant 30 min. prior to insertion process." 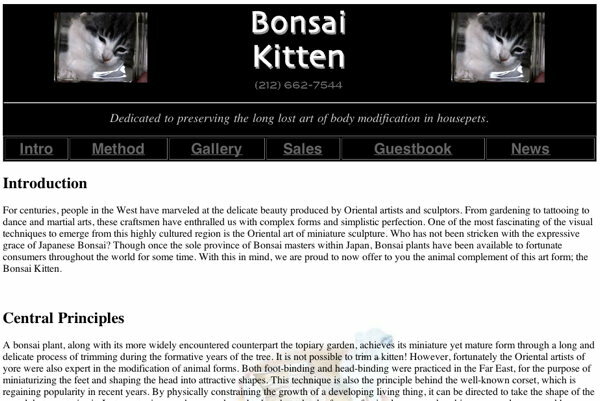 BonsaiKitten.com almost immediately generated a huge amount of controversy. Furious animal lovers insisted that it be closed down. The Humane Society of the United States, among others, denounced it. It was soon discovered that the site was hosted on web servers at MIT, and that it had been created by MIT students. The identity of the students was never revealed. However, the students conducted a few interviews with the press using the alias "Dr. Michael Wong Chang." They explained that the site was a prank designed to satirize "the human belief of nature as a commodity." They also expressed surprise at the reaction of animal organizations. "To be honest, we never expected the animal organizations to get involved at all," Dr. Chang said. "We thought they'd understand." The fact that the site was a hoax had been obvious to many from the start. After all, the bones of kittens will not actually mold to the shape of a container. But the fact that the site was a hoax did little to calm animal lovers. Instead, their anger continued to grow. In February 2001 the FBI got involved and subpoenaed all information about the site from MIT. But its investigation came up empty when it found no evidence of animal abuse or of the sale of Bonsai Kittens. Faced with growing controversy, MIT elected to remove the site from its servers. But that wasn't the end of BonsaiKitten.com. What started was a game of 'cat and mouse,' as the site began relocating from one server to another. Whenever furious animal lovers discovered its new location, they would bombard its host with criticism until the weary host, buckling under the weight of the attacks, would force BonsaiKitten.com to move on and find a new home. This continued until the site finally found a home on Rotten.com. It remained there for many years. As of 2007, a version of the site (minus some of the original images) was hosted on shorty.com. The original domain name, bonsaikitten.com, became a portal for advertisers of cat food and discount pet medications. A site that we were able to shut last year has returned. We have to try to shut it down again! A Japanese man in New York breeds and sells kittens that are called BONSAI CATS. That would sound cute, if it weren't kittens that were put in to little bottles after being given a muscle relaxant and then locked up for the rest of their lives!! The cats are fed through a straw and have a small tube for their faeces. The skeleton of the cat will take on the form of the bottle as the kitten grows. The The cats never get the opportunity to move. They are used as original and exclusive souvenirs. These are the latest trends in New York, China, Indonesia and New Zealand . If you think you can handle it, view http://www.bonsaikitten.com and have a look at the methods being used to put these little kittens into bottles. This petition needs 500 names, so please put your one name on it!!! Copy the text into a new email and put your name on the bottom, then send it to everyone you know. Critics argue that, even if Bonsai Kitten was simply a hoax, it was too shocking, that it crossed the line of decency and promoted cruelty to animals. Defenders of the hoax point out that the best satire is often cruel. It seems clear that the MIT students were not suggesting people actually torture kittens, just as Jonathan Swift was not actually suggesting that the rich should eat the children of the poor when he wrote his famous satirical article, "A Modest Proposal," in 1729. It has also been noted that the Bonsai Kitten hoax reflected the techie culture of MIT, in the sense that it strove to transform the messy chaotic natural world into linear, geometric precision. Or rather, it sought to transform cute kittens into rectangular monsters. A few sites have attempted to build upon the Bonsai Kitten joke. 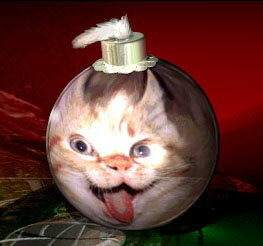 For instance, omegagrafix.com hosts a satirical page that offers to sell Bonsai Kitten Christmas Tree Ornaments. The page states, "Notice the splendid use of the tail to form a hanger. Imagine how this will look gracing your yule tide tree. Kids love to watch em blink when they poke at them. And no mess to clean up! The ornament is its' own kitty litter box." The omegagrafix.com page includes a disclaimer: "This ad is stictly bogus. All checks and money orders will be donated to the local pet cemetary, who, btw have yet to register any complaints of abuse or unusual activities towards cats, kittens, deformed trees, LongNecks, or clueless retards who believe this to be God's Own Truth." -- YOU PEOPLE ARE DISGUSTING! YOU SHOULD BE ASHAMED OF TREATING LITTLE HELPLESS ANIMALS LIKE THAT....HOW WOULD YOU LIKE TO BE STUCK IN A GLASS BOX....HOW CAN YOU BE SO SICK AND TWISTED..YOUR GONNA GO TO HELL AND BURN THERE BUT THAT ISN'T EVEN A GOOD ENOUGH PUNISHEMENT. I DON'T KNOW WHAT ELSE TO SAY BUT THAT ITS SICK AND TWISTED. SHAME. -- you people have no heart.u should be ashamed of yourselves i would love to find you and put you into one of those jars.I would super glue a tube to your but and feed you to a straw.I would find a bear and let it sit on you for 2 years in a rectangular circle or even a square jar.I would laugh i your sqished up face on the side of the jar.I would sell u to tha public so they could see you rot in pain and hope that you rot in hell for thid f***in idea that you have came up with. -- you make me feel really sick . you are a cruel man. How would you like it being stuffed in a jar. By a giant kitten. Me and my friends have sighned a pertision to get this website off!!! you are a b*****d pleasre leave our kittens alone!!!!!!! -- what the hell are you torturing cats for??? you should all be put in prison for it. I am joining in getting this project stopped! this is completely insane! -- You guys are sick! what the hell is your problem. I know where u live and were sendin the humane society on you. You guys are horrible... I want you to f*****n die! F*** OFF MOTHER F******S ILL SET YOUR HOUSE ON FIRE! For the record, let us state that, except for posting this article, we have nothing to do with Bonsai Kittens. Threatening to kill us will not help the campaign to shut down the Bonsai Kitten site. Janet Kornblum. (February, 2002). "Bonsai Kitten site brings animal-rights roar." USA Today. Declan McCullagh. (February 9, 2001). FBI Goes After Bonsaikitten.com. Wired.com. Do you have to spay or neuter the kitten? Oh my goodness! Sick stuff wethere it was a prank or not.. I was in high school when the original joke of the "Bonsai Kittens" appeared on the internet. I was also becoming fluent in a second language, sailing through art classes, and excelling at living sciences. After a few minutes of studying the pictures posted and reading the descriptions on the page, I burst out laughing; it was too obvious to me that this was indeed a prank, and a very creative and well-executed one at that. Sometimes, people get so wrapped up in things that occur around them and to them that they forget that one needs to laugh or they'll go mad. Instead of condemning an admitted hoax, these imagination-deprived overly-sensitive folks need to crack a smile, then crack open a book. I do personally recommend anything writted either by Jonathan Swift or Piers Anthony. Both are excellent authors who know how to tell a joke and use the English langage in the written form correctly. The joke in itself isn't that funny, but it's the people's reactions that just kill me. How dumb do you have to be?